Updated on Sunday, September 19, 2010. 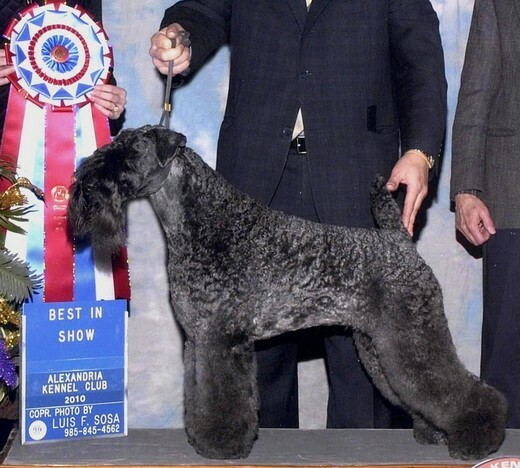 We have the privilege and the honour to have several top AKC 10 dogs and AKC Grand Champions Kerry Blue Terriers directly associated with Diana's Kerries as offspring and/or part of our breeding program. "Finnegan" GCH CH Irisfingel Blue Badge owned by George Sullivan is sire to Brianna "CH Diana's I Am A Legacy"Owner: Diana L Thompson; Breeder: Diana Thompson and George Sullivan; AND Xena "Diana's Knick Knack Paddy Wack"Breeder: David Poynter; Owner: David and Teri Poynter. "Blue" AM GCH CH and CAN CH Aon Rhythm N Blues bred by Am CH and Can Ch Edbrios Brave Heart "Gibson" and Ch Diana's Destine For Fame "Katy." Owner: Marlyn Johnson & Pat Johnson Breeder: Diana L Thompson, Marlyn Johnson & Pat Johnson.